Home / Read / Are Seniors Playing Video Games for a Challenge? Are Seniors Playing Video Games for a Challenge? Gaming is no longer an activity for kids and teenagers alone. Today, a good percentage of elderly people are engaged in gaming. Apart, from enjoying playing video games, seniors also reap numerous benefits from the gaming activity. Playing games can work wonders for physical and mental health for the elderly. Happily, playing a game is not a difficult task. Senior persons can easily adapt to new technology and even make it a hobby to play digital games. The percentage of elderly people playing games has risen from 9 percent in1999 to 50 percent in 2018. This means everyone, even the elderly are aware of the benefits of video games. Are seniors playing video games? Gaming has shown to provide many health benefits to both children and adults. Playing video games can help increase happiness, improve mental capabilities, and help to build happy relationships. Whether you are a kid, a teenager, an adult or an older person, gaming is an activity that can benefit you. Playing a digital game means downloading one on your mobile gadget, installing one on your PC or buying a physical game to play on a console. If you are an elderly person just getting started, there are many game genres to select, and gaming systems as well. The good news is that when you search online, you can find some best gaming products for any age. What kind of games are adults and older adults playing? Based on research, adults and senior citizens love to play educational video games, instead of violent ones that are loved by kids and teenagers. Around 52 percent of the elderly people play games that test their memory and logic skills. Also, studies show that elderly people who are engaged in gaming have excellent hand-to-eye coordination. This is due to the ability to watch the screen and at the same time moving the controller or the keyboard. For elderly people, digital games provide joy similar to physical activities. They love to play popular cards and board games that are offered on digital platforms. Over the years, studies have discovered numerous benefits of playing video games. Here are some main benefits of gaming available to elderly people. 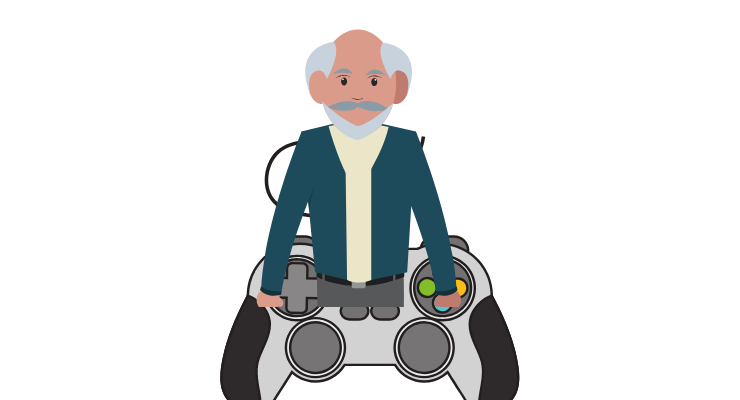 Elderly people over the age of 63 report higher levels of emotional satisfaction after playing games. A research was conducted to compare psychological functions between seniors who played video games and those who did not play. The study found that game players were more social and happier than non-gamers. It was also noted that the mood of gamers improved significantly after playing games. One major difference was that non-gamers reported higher levels of depression, stress, and negative emotions. Apart from senior citizens being happy, gaming is a healthy activity that helps them improve walking speed and balance. When they play the games, they are required to pay visual-attention and make quick decisions. This shows that gaming can enhance physical performance as well. A study conducted to examine how video games enhanced physical activity was tested at an elderly home care center. The research found that seniors who engaged themselves with digital games for an hour every day or 3 times a week had improvements in speed compared to non-gamers. The study concluded that gaming can help enhance their walking speed and balance. Most elderly people have poor cognitive-focus and spatial abilities. But during gaming, these skills can be improved, according to research. In later studies, elderly people aged 60 to 77 years played strategy games for at least two hours a day for 2 weeks. After that period, it was discovered that gamers scored very well in their cognitive skills than non-gamers. Gaming also improved their moods and were able to make decisions faster than before. Hence, if you feel your cognitive abilities are weakening, gaming might be a good solution. Another benefit of gaming for seniors is that it can reverse brain aging. This is something that has been proven by numerous studies. A funding discovered that participants between 60 and 85 years old who played multiplayer games for 12 hours in a month improved their performance immensely. Senior citizens improved so much that they could easily beat gamers who were playing the game for the first time. Also, the elder’s attention span and memory capacity increased while playing games. It also allowed them to maintain the newly advanced brain functions 6 months after the study. Apart from engaging your mind and hands, gaming forces the player to switch very fast between several tasks. The gamer is required to be swift and accurate when making decisions. This makes the brain flexible and remains nimble. Since digital games engage the brain, they have the ability to reduce stress. The elderly should play games at various points during the day and at night if they have trouble sleeping. Also, gaming is a great activity for the seniors to come become social. When playing multiplayer games, they form groups and play together with other friends to accomplish various tasks. Apart from enhancing walking speed, improving hand-to-eye coordination, and helping to maintain balance, video games have numerous physical benefits. For people who are suffering from arthritis, games have shown to be very effective. Also, for elderly people who might be suffering from chronic pain, the distraction of playing a game can reduce pain. Gaming is a great activity that can improve poor sight as well. Hence, video games are not just for kids and teenagers. Adults and our seniors can benefit as well from these games. The benefits mentioned are just a few that elderly people can receive after playing video games. But, since there are a number of genres to choose from, you may have to ask your grandparents the type of games they like to play. Happily, no matter the type of digital game you choose, it can improve your overall health, help you make new friends and keep you entertained for hours. Previous Do Video Games Make you more Social?